Let’s face it, our hair would be a mess without the tools we need to help care for it. Personally, my hair would look like a disheveled lion’s mane in the morning if I didn’t at least have a comb. If your hair isn’t quite looking the way you would like it to, it might be time to invest in these tools for wavy or curly hair. Is your hair looking stringy? Damaged? Broken? These are all signs of hair that’s been torn to bits by amateur brushes not meant for curly or wavy hair. 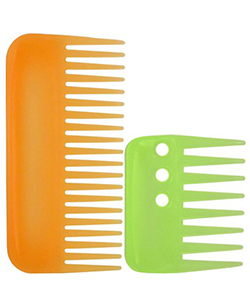 Invest in a wide-toothed comb. It will detangle your hair without pulling or breaking your strands. It’s a much healthier option for curlies, coilies and wavies that your locks will certainly appreciate. Yes, even your towel affects the quality of your hair. Most towels are rough and damaging to curls and waves. The long term effects can be unrelenting, so switch over to a microfiber towel while you can still save your curls! If you are worried about the cost, you can also use an old T-shirt to gently dry your tresses. Microfiber towels are definitely worth it, though. I’m currently using the DevaCurl Deva Towel and I love it. I have less frizz and more waves. 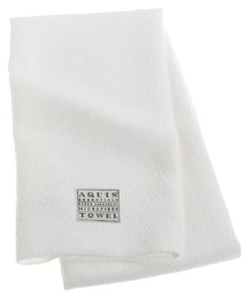 You can scrunch your waves and curls with this towel in your hand to get more definition. For ladies with waves and curls, it’s essential to have a diffuser that can aid in the curl process. For most 2as like me, waves can fall limp once they dry out. 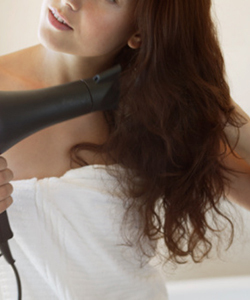 Invest in a professional diffuser that you can attach to your blow dryer. 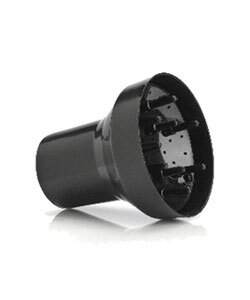 I’m currently using the Luxor Professional Finger Diffuser. It’s inexpensive and top notch. My waves are almost curls when I use it. A diffuser can make all the difference in your finished hair style if you know how to use it! I don’t want to sound like your average door to door salesman, but you really do get the quality of what you pay for. If you’re not willing to pay for a good quality hair dryer, you won’t get one. I strongly recommend investing in a professional style hair dryer that has the cool shot option. I’m using the Solia Professional Thermal Ionic Dryer. After diffusing or drying my hair, I blast it with cool air to get a nice shiny finish. If you’re always conscious about how much heat touches your hair, replace the hot air diffusing with cool air for a much healthier alternative. Every head of hair, no matter what texture, needs a good therapy session now and then. I’ve tried them all: avocado masks, deep conditioners and oil treatments the like, but they all have one thing in common. They’re messy! And if you go the homemade route, you have to sit with your hair dryer over your head, which is annoying and time consuming. The thermal Hair Therapy Wrap makes it super easy to deep condition your hair with heat. 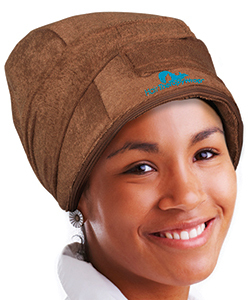 All you have to do is heat up the gel packs, slip them into the turban and it stays warm for 30 minutes. Most ladies love the fact that you can deep condition your hair and have the freedom to walk around. The convenience is worth the investment. What are your must-have curly hair care tools?